Listen up! I have found the best way to make a sharpie pillow! Well, in my opinion at least! 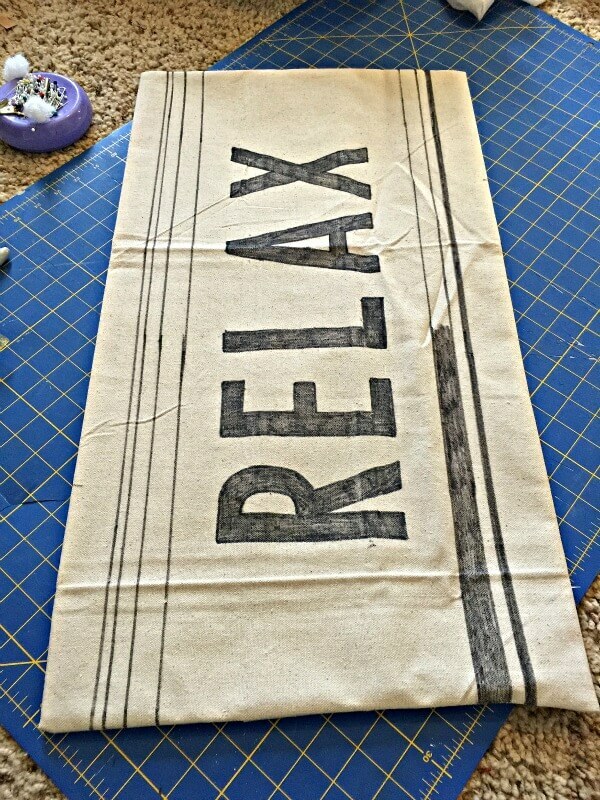 Often times when I am creating a pillow with sharpie markers, I really like to create a freehand design. 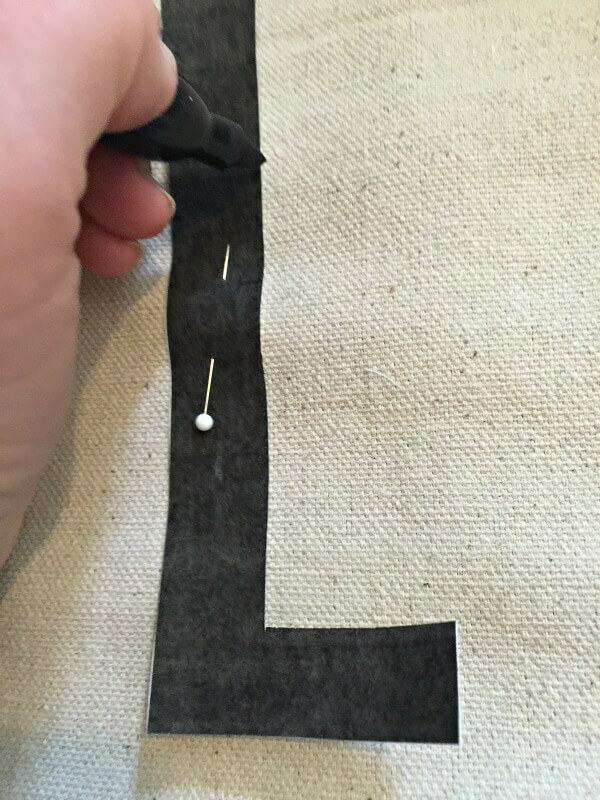 This how to is a specific method for a specific style pillow. 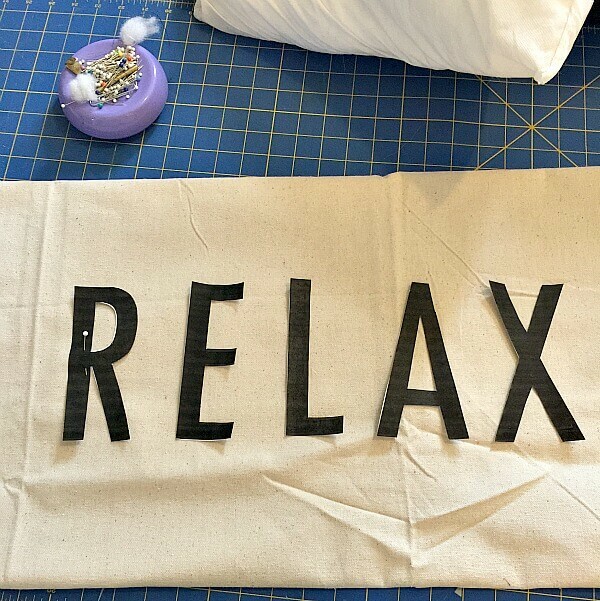 Before I get started with the instructions on how to create the sharpie design on the pillow, I thought I would tell you how I created the pillow case. I purchased drop cloth from my local hardware store. 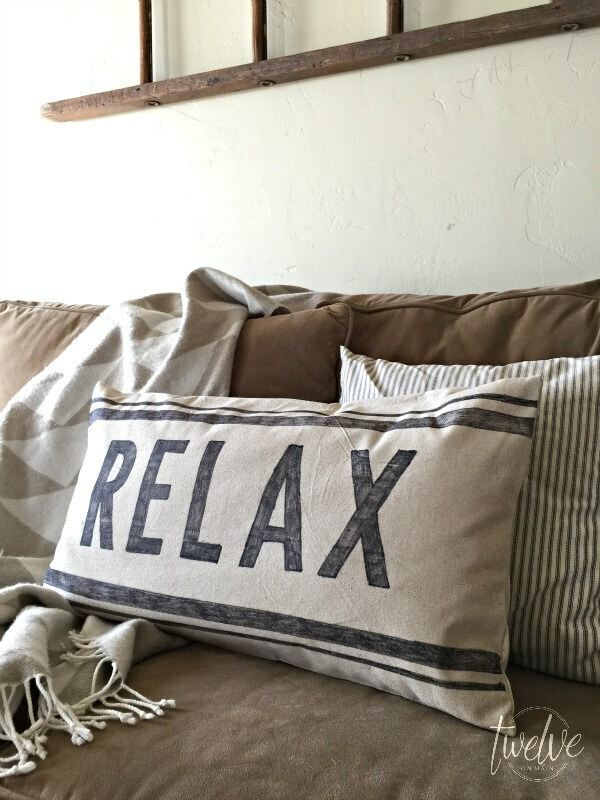 I cute the fabric to size and created an envelope style pillow cover. 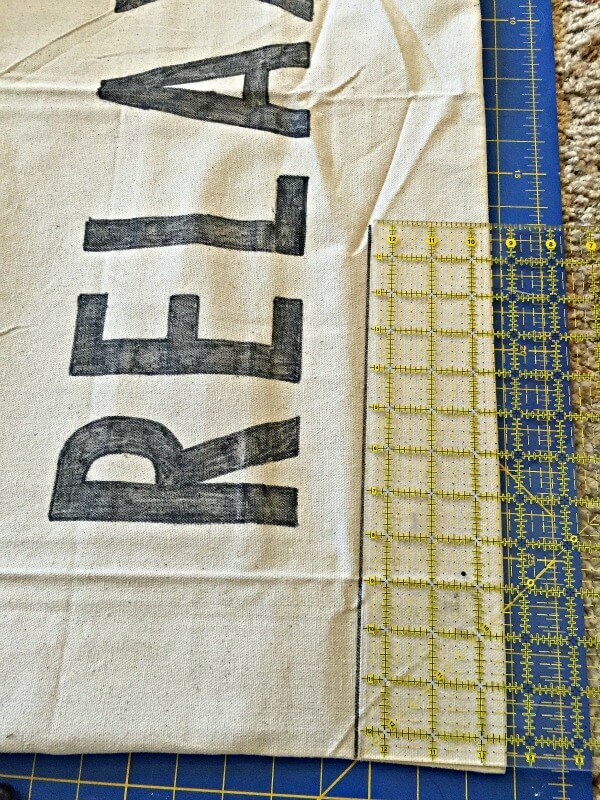 Once I had the pillow cover made I moved on to the word design. I used my Microsoft Surface Book along with my Microsoft Office Home Download to create the wording for this. It is interesting the way that Microsoft is doing their office program, instead of purchasing the program, you purchase a one year subscription. The great thing about this is that you can share the download with other computers in your household or people that you want to share, with a limit of 4 I believe. So on to the wording. 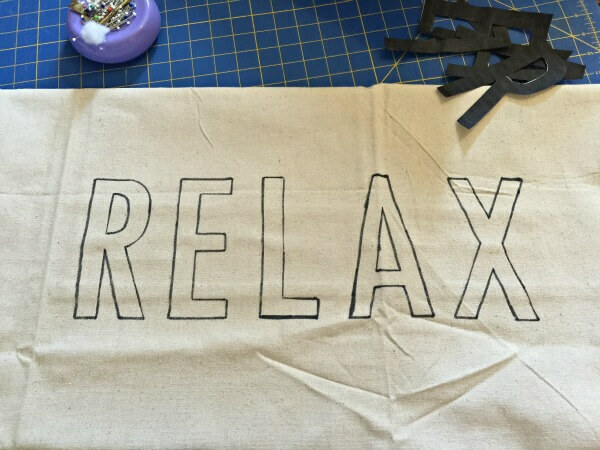 I picked a style that had a slightly taller, and square shape to the edges of the letters. 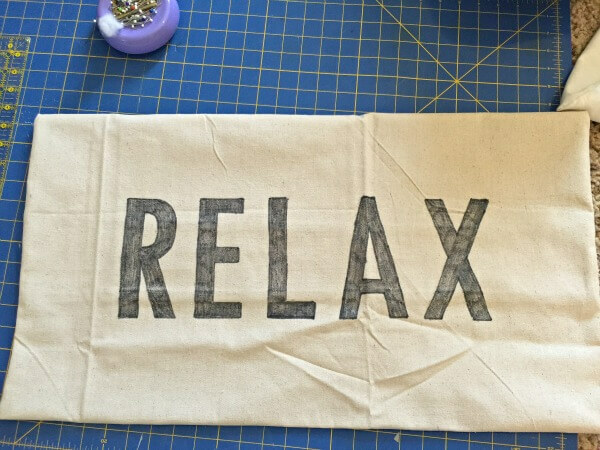 I have a link here to a printable of the word RELAX, so that if you want to print it off, its the exact size I used on my pillow, and if you want to create one it will make it that much easier. 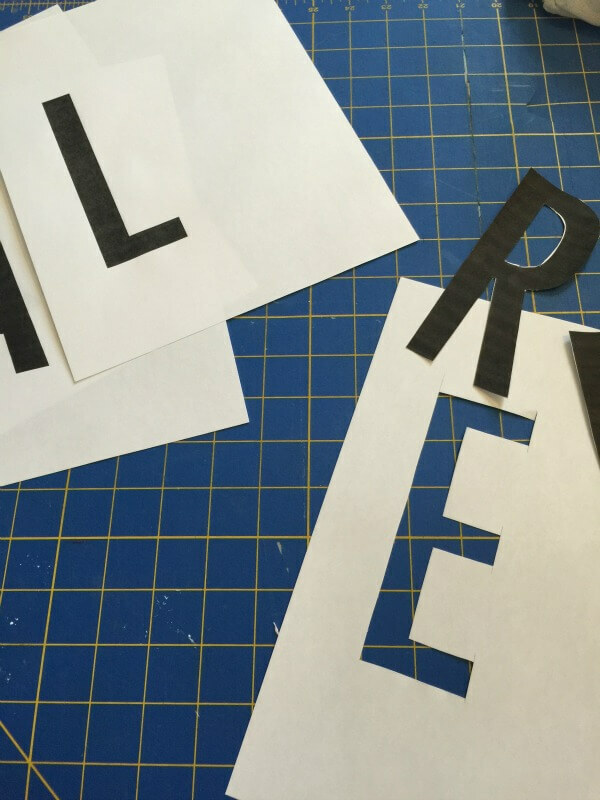 Once I had the letters printed out, I started to cut them out with the X-acto knife. This was easy and quite painless, and it creates a much cleaner and precise line. 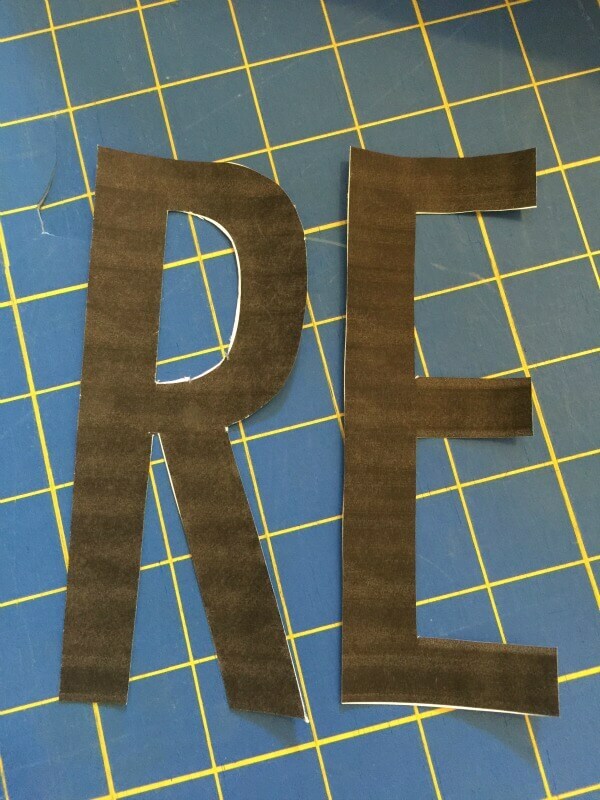 I cut each letter out and set them aside. Once they were all cut out, I pinned them onto the pillow. I centered it in the pillow and made sure they were each distanced correctly before pinning them down. 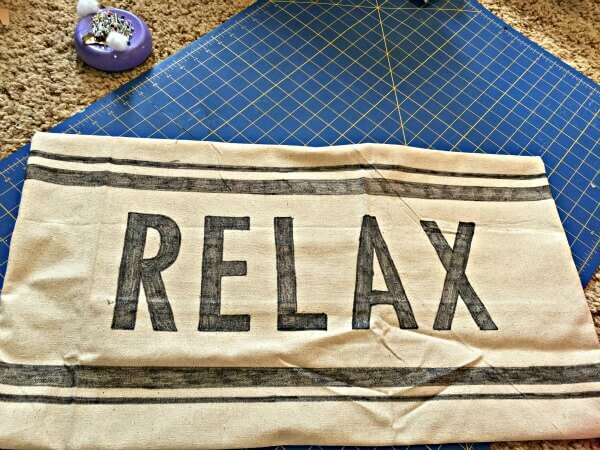 Relax. Its not that hard. 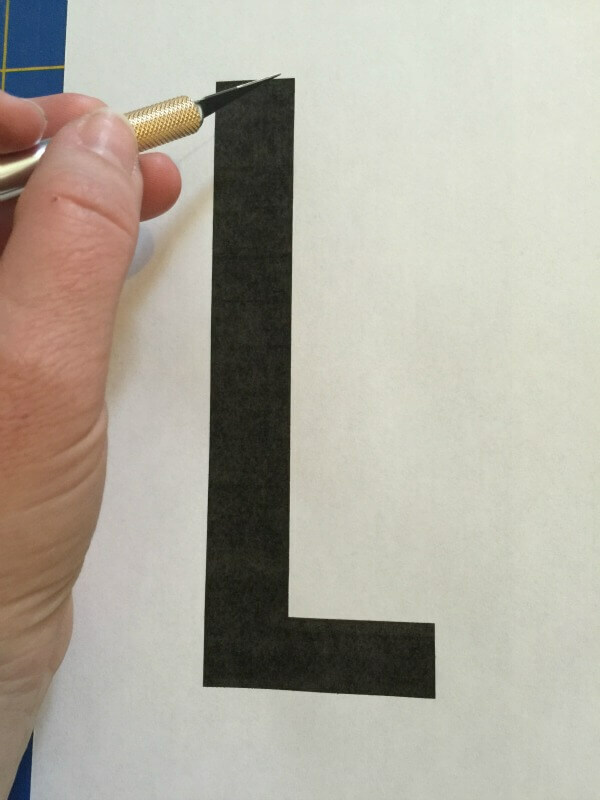 I outlined each letter with my sharpie marker. I used a light hand to do this. I didn’t want a solid line. I promise, this is the best way to make a sharpie pillow. You then get to color it in! Who doesn’t like to color! Adult coloring books are all the rage these days, just imagine that is what you are creating. Can you see the light hand? If you want it to be more solid, you definitely can, but I wanted a more distressed look. I then measured in from each side to create two stripes on each side. The inner stripe was 1/2 inch wide and the outer stripe was 1/4 inch. Guess what you get to do now. Color them in! Here it is all done! I then ran it over with an iron for a bit to get rid of some of those wrinkles and form what I hear, a little heat is good to set the Sharpie marker. The last step is to insert the pillow form into the cover. Super Easy. This pillow made its way into my family room loft. This is where we come to RELAX. It’s where my kids spend their Friday nights. Every Friday night without fail, they spend it having a sleep over in this room. The great thing about this type of pillow cover is that it is extremely kid friendly. 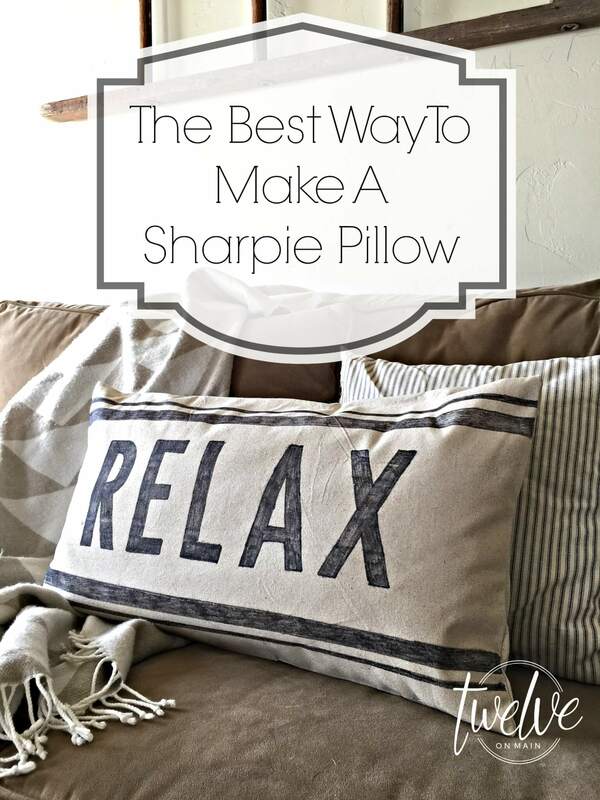 I hope you agree that this is the best way to make a sharpie pillow. Its not the only way, that is for sure. If by chance you have an amazing set of letter stencils in the right size, that would definitely be easier, but my stencil collection is not quite vast enough to have said letters. 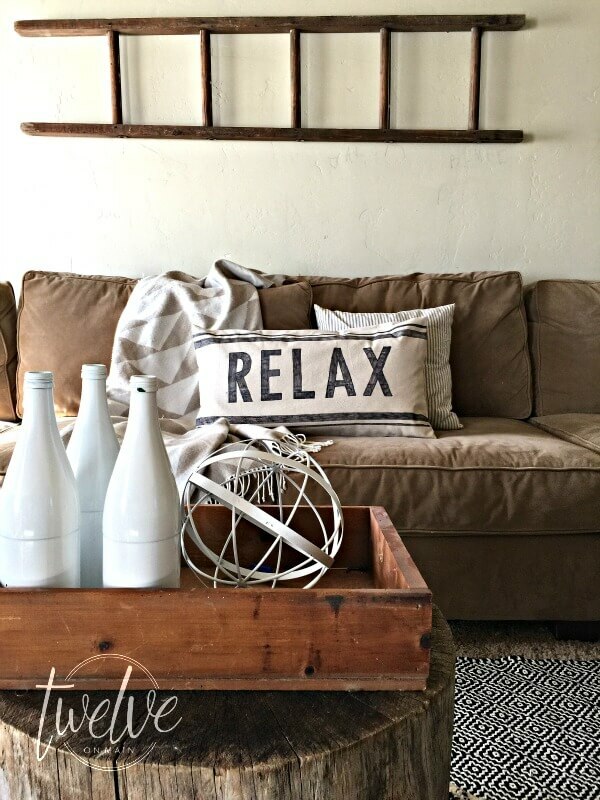 This is a great way to add an amazing pillow to your home decor without spending very much money. I even reused the pillow insert from another pillow that I had grown tires of. Try it out. I promise you can do it! So cute! What size pillow insert did you use? I may have to try this! I used a 16 by 28 since that is the size I already had. I used an insert from a pillow I had bought for Christmas. Never done a sharpie pillow before… wondering if it would be okay for sleeping on. wanted to do one for my son’s bedroom but am picturing him waking up with sharpie on his face! Love this so much. Pinning! Thanks for sharing at Your Inspired Design! 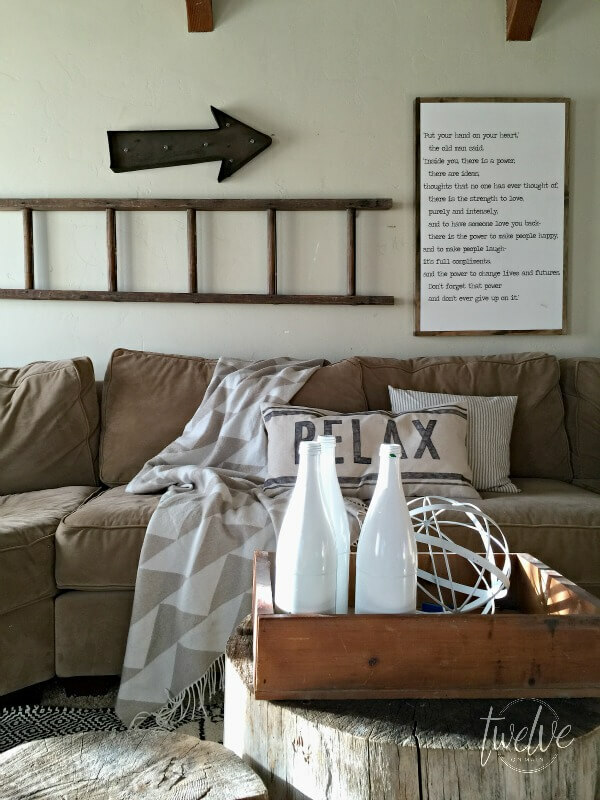 Can the pillow be washed with the Sharpie letters fading? I have washed mine before and the sharpie hasnt faded much. I would recommend washing on cold if you do. Thanks, will definitely gives this a try. For sure! Thanks so much! I am glad yours worked out! Fantastic, thanks so much for stopping by!